A strong pelvic floor is a healthy pelvic floor, and a more confident YOU! We should all do our pelvic floor exercises (they’re not just for new mums), so why don’t we? Is it because we don’t have time? We’re an exception to the rule and we actually don’t need to? Or is it, as a recent Kegel8 study revealed, because in fact 50% of women in the UK don’t actually know how to effectively exercise their pelvic floor? Perhaps this is why ‘laughter leaks’ are so common amongst women and brushed aside as just ‘part of being a woman/new mum/certain age’. The truth is you have two choices; you can ‘pad’ the problem, laugh-off the odd leak in public and allow the problem to get worse; or you can acknowledge that what you are experiencing are the early symptoms of a weak pelvic floor and take control with the Kegel8 Tight & Tone pelvic floor exerciser. How does the Kegel8 Tight & Tone pelvic toner work? We don’t want to make it sound too good to be true but the Kegel8 Tight & Tone exercises your pelvic floor for you – targeting the right muscles, in the right way; giving you a stronger pelvic floor in just 12 weeks! 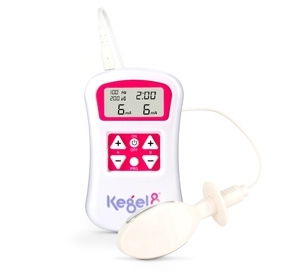 Using neuromuscular electrical stimulation (NMES) the Kegel8 Tight & Tone sends electrical pulses deep into the muscles via a vaginal probe; stimulating your pelvic floor muscles to contract which in-turn builds strength and tone, improves circulation to the area and reinvigorates the muscles. Kegel8 is the easiest and most effective way to exercise your pelvic floor. The Kegel8 Tight & Tone has 9 pre-set pelvic floor strengthening programmes, each designed to target the muscles in different ways, to treat different symptoms, and each feel different; whether it’s the gentle fluttering of a muscle relaxation programme, the tapping sensation of your muscle nerves being stimulated or the contraction of a strong workout – you are always in control of the intensity with the easy-to-use controller with plus (+) and minus (-) buttons. Is the Kegel8 Tight & Tone right for me? The Kegel8 Tight & Tone is right for anyone; our pelvic floor muscles naturally begin to weaken from around the age of 18. You don’t have to wait to experience the signs of pelvic floor weakness such as bladder leaks or a sudden urge to run to the bathroom; Kegel8 Tight & Tone is the perfect way to prevent these symptoms and begin strengthening your pelvic floor as part of a fit and healthy lifestyle. Whilst the proportion of women that suffer ‘laughter leaks’ is high, it isn’t an inevitable part of life/ageing/childbirth as many think. You may instantly consider pads or medication but neither of these options will treat the cause of the leaks (a weak pelvic floor) nor will they make you feel good about yourself! The Kegel8 Tight & Tone targets the cause of embarrassing leaks by strengthening your pelvic floor muscles for a longer-term solution to fix the problem. That’s your pelvic floor! It could be weak or even damaged if you’ve been through childbirth. The strength of your pelvic floor muscles correlates directly to your intimate sensation and quality of orgasms so you know what you need to do! When your pelvic floor muscles are weak, they are loose which means nothing feels the same for you and it certainly won’t feel the same for your partner either. In just 12 weeks Kegel8 will strengthen your pelvic floor muscles, giving you more control and sensation during intimacy – and trust us, he’ll probably notice before you do! Is it true my stubborn ‘pot belly’ could be due to weak pelvic floor muscles? Yup! Think of your pelvic floor muscles as a hammock of muscles that reach from the front of your body at the pubic bone, to the back at your coccyx. A strong, healthy pelvic floor helps us to maintain good posture and helps draw that tummy in. A weak, saggy pelvic floor can leave us with back ache and a bulging tum. Your Kegel8 Tight & Tone unit is your controller. It houses 9 clinically proven pelvic exercise programmes to build strength and tone, reinvigorate muscle nerves, and even relax muscles to relieve pelvic pain. In addition, the Tight & Tone gives you 3 customisable programmes which can be used by a Physiotherapists or Continence Specialist to tailor their own programmes to suit your treatment. You also get your vaginal probe which is lightweight and ergonomically designed for easy insertion and comfortable use. The electrode surface area is designed for optimum connectivity with the pelvic floor muscles to ensure that every kegel counts! The Kegel8 Tight & Tone comes with all the accessories you need to get started as soon as you receive it – including the relevant wires to connect your probe to the controller and batteries. Tight & Tone controller | 9v battery | Pelviline probe (replaceable part) | Lead wire | Instructions. Waveform: Asymmetrical, rectangular bi-phasic with zero DC current..
Selectable pulse width: 50 μS – 450 μS [2% accuracy]. Pulse Rate selection: in the continuous mode 2 – 100 Hz [2% accuracy]. Time duration of the treatment selectable: 1 minute to 90 minutes. Open Electrode Detect: If an open circuit is detected at the output of channel A or B the output current will be reset at zero. Ramp up time 0.3 – 9.9 seconds.